So you’ve been put in charge of your friend’s bridal shower! Whether the bridal shower you are organising is a small gathering of family and close friends, or a larger affair read on for some ideas on how to theme the day. Bridal showers are not necessarily a tradition that women stick to these days as they are often replaced by a hen’s night instead. But bridal showers don’t have to be a boring afternoon of looking at kitchen utensils – there are many different themes that can bring a little excitement back into the day such as the ones listed below. Lingerie Shower: Spice things up a bit by organising a lingerie party. It works in much the same way as a Tupperware party – a party organiser will turn up and take the guests through a showing of lingerie, which will then be available for purchase. The more lingerie purchased, the more the bride-to-be receives gifts from the party organiser and all the guests get to go home with something new. Cellar Party: This is a good theme for the couple that has everything. Help the bride-to-be stock the cellar by asking guests to bring along a bottle of their favourite wine as a gift. Alternatively they can bring wine-related gifts such as glasses, glass charms or bottle openers. A fitting game to play at this type of party is ‘guess the wine’. Cover the labels on various types of wines and pour them into small plastic glasses. Give each guest a piece of paper with the description of each type of wine listed on it. As the guests try the wine – in a jumbled up order – they have to see if they can guess which one it is from the descriptions. 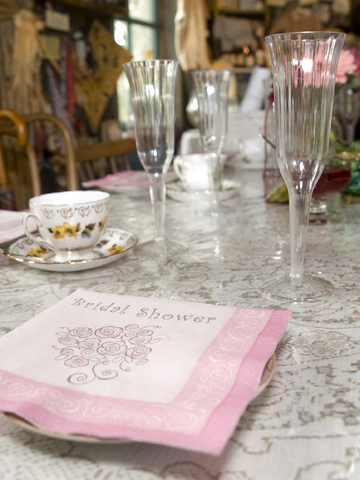 High Tea: For that extra touch of class why not make the bridal shower a high tea. You could either book into an actual high tea restaurant, or you could create the high tea at home. Buy a selection of pastries, pretty cupcakes and sweet slices. Make some finger sandwiches such as curried eggs, chicken mayonnaise, and ham and cheese. As gifts, guests can bring along different types of tea, teapots or even tea towels for the bride-to-be. Pamper Shower: Organising a wedding can be a very stressful time for the bride, so a bit of pampering is always appreciated. Best suited to the smaller groups, try booking into a day spa in your area for the bride-to-be and her closest friends. Pedicures, manicures, facials and massages can often be done in groups while enjoying a glass of bubbly. Tell guests not to bring gifts as they can just pay for their pampering session instead. It is a good idea to hold this type of bridal shower over a weekend or two before the wedding so the bride is relaxed, pampered and ready for the big day. If none of these themes feel suitable for your friend, trying dreaming up an idea that suits either her or her husband-to-be. For example it could be themed around the honeymoon destination with thongs, cocktails and beach umbrellas. Whatever you chose, I’m sure the bride-to-be will love it and you will all have a great time.